If want the best and authentic Magnilighting (TM) product just like our satisfied customers, make sure you buy ONLY From TODAY'S DEALS STORE. Other sellers are selling our Copied Products! You never know when you'll need to read tiny print on a document, minuscule instructions in a cookbook, or something urgent like taking out a splinter in your kid's finger. You need the perfect reading magnifier within reach. Why you must have our magnify glass? - Effortless to use for many purposes! Superior Clarity Anytime - Guaranteed! When it comes to magnifying objects, our reading magnifying glass is your best bet. It is equipped with 2 LEDs for the large lens, and 1 LED for the small one, powered by 3 AAA batteries (not included), and activated by on/off switch button. The 3x magnifying large lens (75mm/3in) and 45x magnifying small lens (22mm/0.8in) are perfect for reading, circuits, jewelry evaluating, and infinitely more. The lens surface is smooth, anti-scratch and crystal clear to magnify objects clearly without distortion. The 4.3" handle is easy to maneuver and comfy to hold. So what are you waiting for? Order yours now and enjoy the clearest viewing experience! 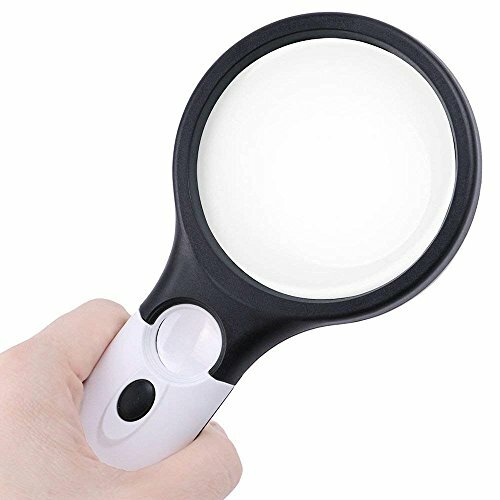 Product Dimension: Large lens 3", small lens 0.8", handle 4.3"
STRUGGLE NO MORE to read a full line of print across the page, this magnifying glass featured with 3x magnifying large lens (75mm/3in) and 45x magnifying small lens (22mm/0.8in). Perfect for reading newspaper, fine print, small printing on pill bottles, and even reading the tiny washing instructions on garments. THE BUILT IN 2 LED LIGHT for the large lens and 1 LED for the small one provide the amount of light you need to read or work in low-light conditions even at night; perfect for bedtime reading. The magnifier is powered by 3 AAA batteries (not included), make sure to put the batteries to activate the light. TAKE IT ANYWHERE YOU GO because the size of our handheld magnifying glasses can fit conveniently in your bag or purse. The 4.3" handle is easy to maneuver and big enough to fit in your palm comfortably. A useful tool to help you read the small labels on produce when grocery shopping. THE SHATTER-RESISTANT GLASS FOR LARGE LENS and small acrylic lens are the perfect combinations to ensure superior clarity and durability. The lens surface is smooth and will magnify objects clearly without distortion. Our magnifier glasses is lightweight enough for seniors who might have weaker hands and grips. GREAT HELP FOR MACULAR DEGENERATION. Make your grandparents excited and let them see everything better. Help them read the pill bottles with ease and have a better look at a calendar to find an appointment date. Order yours now and enjoy the clearest viewing experience! If you have any questions about this product by Magnilighting, contact us by completing and submitting the form below. If you are looking for a specif part number, please include it with your message.